U.S. District Judge Amos L. Mazzant of the Eastern District of Texas issued a nationwide temporary injunction today blocking the overtime rule from being enforced on its scheduled effective date of December 1, 2016. The overtime rule was expected to provide over four million currently salaried workers with overtime pay. 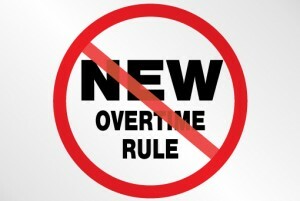 In particular, the overtime rule would have changed the requirements for employees to be exempt from overtime by increasing the salary threshold requirement from $455 per week ($23,660 per year) to $913 per week ($47,476 per year). As a result, all employees earning less than $913 per week would have been paid overtime for any hours worked in excess of forty hours in one work week. Although many employers have already reclassified employees based on the new overtime rule requirements, these employers should seek advice from counsel before reversing the changes that have been made. For example, certain state laws require advance notice prior to changing an employee’s compensation. The preliminary injunction provides Judge Mazzant additional time to decide the underlying case on its merits. The underlying lawsuit involves two consolidated cases filed by 21 states and multiple business groups challenging the overtime rule in multiple respects. Previous Previous post: Personnel Files: Are You Legal?